At 16:45pm on the 4th of June 2015 I met with Ayanda “Kiss” Masina at Tsakane taxi rank. 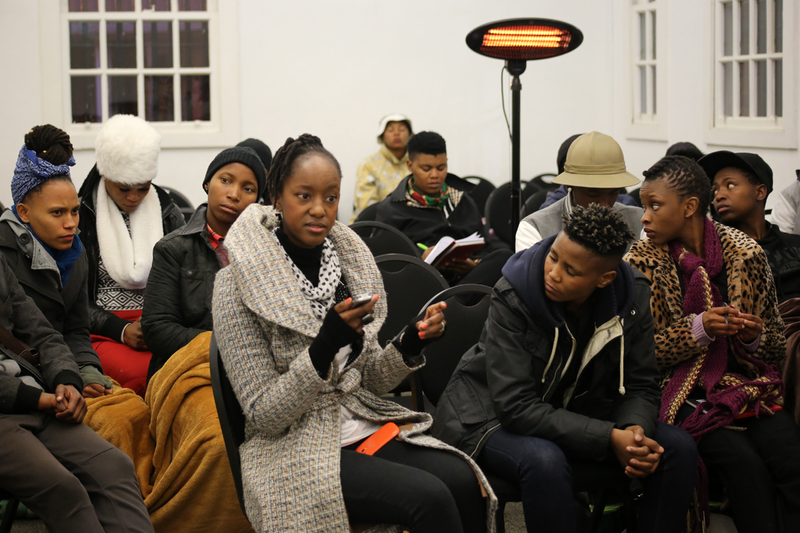 We were meeting as participants of Faces and Phases/Yithi Laba Intergenerational Conference, held at Constitution Hill (Con Hill) from the 5 – 7 June 2015. We took a taxi to Johannesburg and arrived there an hour later, made our way to Park Station. We reached the pre-arranged meeting spot, and found Molebogeng “Lebo” Raphala from Duduza, Nosipiwo”Sphola” Solundwana from Katlehong and Nonkululeko “Sicka star-ban” Mthunzi from Daveyton. Then Collen “CocoHo” Mfazwe from Daveyton joined us. After some time, Sebenzile “Sebe” Shabalala from Umlazi and Phila Mbanjwa from Pietermaritzburg found us waiting and feeling cold. Then an hour and couple of minutes later Zanele Muholi and Lerato Dumse arrived. We bought take-away because people were tired and hungry. Lebohang “Leptie” Phume from Kwa-Thema arrived while we were waiting for the food. After getting our food we went to the parking lot where our transport was parked. Our driver was Sibongile “Sbosh” Mnisi from Soweto, and she is the coolest and most welcoming female taxi driver. We drove to Saffron Guest House in 7th Street Melville, which became our home during the Yithi Laba Conference. I had to share House no.6 with Kiss and Leptie. I’m from the same township with Leptie but we are not close friends. Ayanda is from the neighboring township and we only share a mutual friend, so I guess that made it easier for us to connect. We went to the main house for dinner shortly after arrival and met with other participants. That’s when we introduced ourselves and gave each other an idea about our upcoming presentations during the conference. Then we returned to our rooms; Leptie and I chilled on top of the bed while Ayanda was lying on the couch drinking the coffee I made for everyone. We started having a conversation about friendships, jobs, relationships and the Faces and Phases experience. While still talking, Sharon aka Sicka-staban Mthumzi came and joined us and we lost track of time and slept at 4:00am. We woke up at 6:00am since we were told that breakfast was at 7:00am. We woke up, took a shower and everybody looked good. We made our way to a nearby restaurant for breakfast. On our way to Con Hill “Sicka” and I started breaking the ice, by rapping crazy lyrics since everybody looked a bit nervous and Mam’ Lindeka Qampi recorded that moment. We both didn’t want our fellow participants to notice our nervousness but we had fun. We arrived at Old Fort, Con Hill and went for a guided tour and learnt about the history of Black, White, Indian and Coloured freedom fighters that who arrested and convicted there before South Africa became democratic. We were informed that black prisoners did not have Freedom of Speech and how they had to share showers with about 900 others. We listened to how some ended up smearing their bodies with bath soap, and waited for the rain, before having a shower using rainwater. Strip searches are part of the humiliation that they went through. 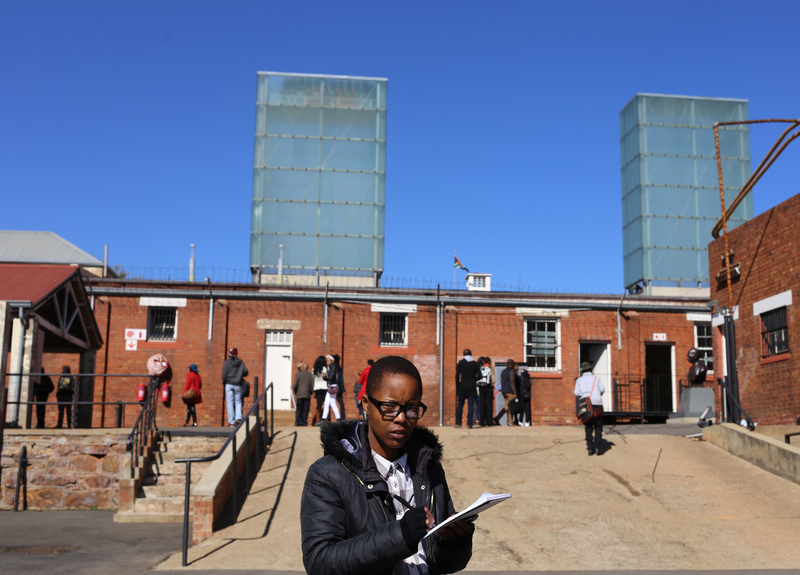 Prisoners who fought for their rights inside the prison were put into Isolation cells called Emakhulukuthu (deep dark hole) and they had to eat rice water since it had starch. The cells challenged some of the prisoners mentally, leading to people writing messages on the door cells, while locked up in isolation. It was an emotional and tough experience for me to learn about our Freedom Fighters who were treated so inhumanly and unkindly. Touring Constitution Hill made me respect all those women and men of all races who fought for the Freedom we have today. Motivational speaker Kea addressing youth at Yithi Laba conference. 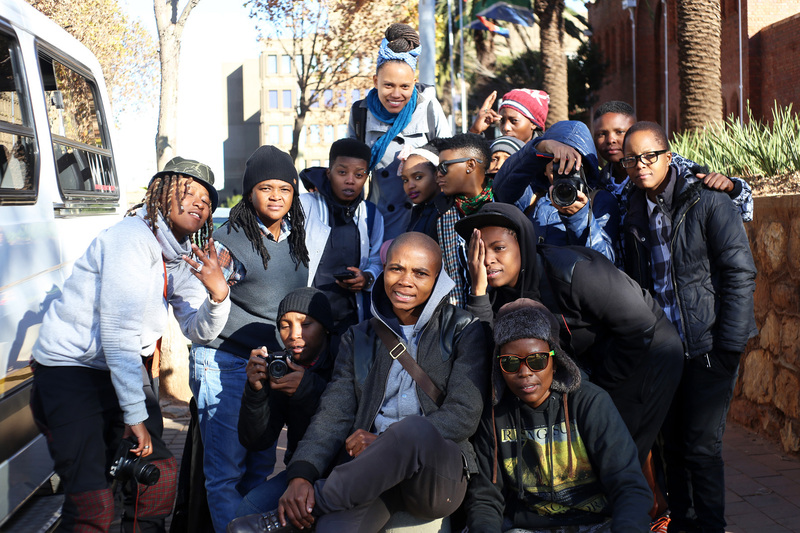 After the tour we were motivated by Kea Modise-Moloto, a lady who runs an NGO called Bontle-Bame based in Pretoria. She mentioned that as people, we ‘don’t have to be trapped by our payday while we don’t feel comfortable in our jobs’, adding that we don’t have to be hostages of the 25th of the month. Kea shared about leaving her job, to pursue what she loves the most, which is to help abused women and children. Since she doesn’t get paid to do that job, her payment is when someone’s problem is handled. She made me think that as people, we should not do things for the price but for the love of it. I am in the process of leaving my job in the South African Police Service (SAPS) and pursue Theology, since I’m passionate about the study of Christianity (The Bible). I’m only doing it for myself, not someone else. I really liked it when Kea said, “Live your life so your actions tell the truth about you” with these words she meant we shouldn’t please anybody by living according to what people want us to be. On the last day of the conference I had to share my emotions since my presentation was a tribute I paid to my late sister, Motlalepula Nkopane. I shared my sister’s engagement day pictures with my fellow Faces and Phases participants. The participants felt like family to me, even if we only spent little time together. The 7th of June 2014 was the day I buried my little sister, she was very special to my two younger sisters and me. Celebrating my sister’s life with people I take as my sisters from other mothers, since I was free, crazy and energetic around them, made my presentation special. I also shared my experiences of working for SAPS and it was fun and crazy because I had to make room to laugh about my work challenges and experiences, because I was home sick, missing my sisters, my dog and its puppies. After the event we had to leave and go back to our different homes. That’s when everybody wished we had a few more days. We still had a lot to teach each other, learn from each other and share with each other. I would like to thank everybody who made Yithi Laba Intergenerational Conference a success. Participating in it made a huge difference to some of us, since there’s a lot we learned and gained. Friendships were made and it was a very outstanding experience for the rest of us to be part of the chosen Faces and Phases participants, even though myself, Ayanda and Leptie gave Muholi a little disturbance with our chit chatting as we sat at the back, on the first day of the conference. This entry was posted in Another Approach Is Possible, Archived memories, Creating awareness, Expression, History, Power of the Voice, South Africa, We Are You, We Care, We Still Can with/out Resources, Writing is a Right and tagged 2015 Yithi Laba conference, Act, Action, Activists, Articles, artists, Black lesbians, Boitumelo 'Tumi' Nkopane, Celebrated my late sister’s life, Challenges and experiences, Collaborations, community, Con Hill, Education, Experience, Expression, Faces and Phases participants, Family, Fashion, Feelings, Friendships, Gauteng, Guest house, Homosexuality, human rights, Introductions, Johannesburg, Meals, Relationships, Respect, Sexuality, Sharing information, Sister, Special moments, Various townships, Visual activism, Voices, We love photography. Bookmark the permalink. Sounds like you all had a great experience – but horrific to read of the humiliations political prisoners endured. I salute you for studying theology since my family/friends thought I should study something that would lead me to a career that would be financially beneficial. Instead I studied Visual Art. I am discussing Zanele Muholi’s work for my final research paper. From people like her I have learnt so much about ethics, values and that passion for what you do is essential to succeed: make yourself happy – step number one.